Saturday evening Steve and I (finally) attended a dinner at the farm that provides our weekly produce. We began buying from Capay Organic (the farm behind Farm Fresh to You) when our kids were small, attended a farm tour when our youngest was still a babe in arms, and haven’t been back since. Until Saturday night. That’s when the good people at Outstanding in the Field set up their third dinner at the farm and, with just a little bit of begging required, I bought tickets. It was truly an outstanding evening. We arrived a little before 5, plates in hand, and enjoyed wine from Heringer Estates and beer from Sudwerk Brewing Company, served by the owners themselves. Passed hors d’oeuvres were interesting to say the least. We both bravely tried fried pig skin and guinea hearts (from the birds we were going to eat later for dinner. They were about the size of pistachios but not as tasty and awfully chewy. Probably not going to serve them at home. We were welcomed by Jim Denevan (Outstanding in the Field) and Thaddeus Barsotti (Capay Organic) shortly after arriving. Thaddeus telling us the story of Capay Organic. Capay Organic is approximately 350 acres, 200 of which will be farmed this year due to drought. the current drought has dried up Cache Creek, the water source that the brothers have relied on their entire lifetimes. These charts indicate groundwater at various depths. Groundwater will be the only way to irrigate the farm this year. Next we took a lovely walk through the farm. 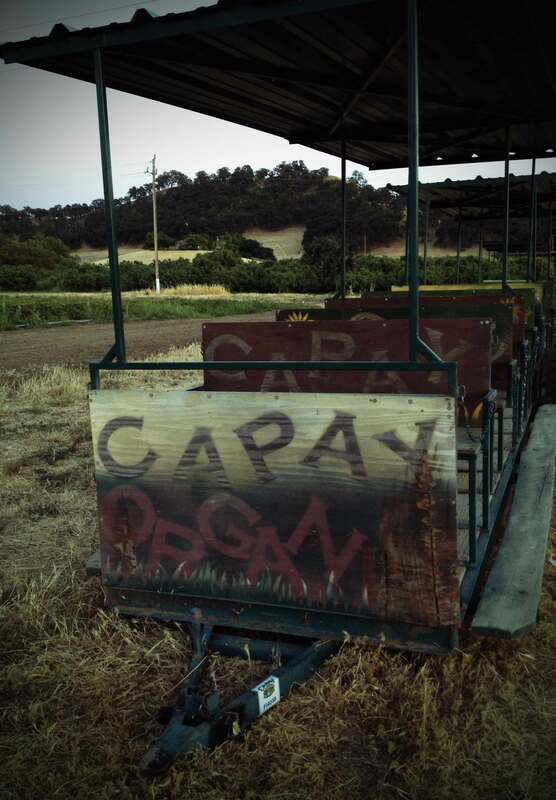 Capay Organic is owned by 3 brothers with day to day operations managed by Freeman and Thaddeus and Noah overseeing wholesale and business operations. Their 4th brother and Noah’s twin, Che, a coast guard pilot, died a few years ago during a search and rescue operation. His presence is still apparent on the farm if you talk with any of the brothers, and a lovely memorial is located prominently near the main house. Thaddeus led our tour and explained the carrot washing machine that he created from an old refrigerator trailer, the quick chiller next to it, the need to drill for water to maintain the farm (something that has never happened in his lifetime), and the growth of the farm since the boys were children. While walking we sampled donut peaches from the tree that Thaddeus planted as an experiment in high school. The bees were enjoying them as much as we did. After the tour we were led to the long winding table along the edge of a meadow under a canopy of oaks and overlooking acres of farmland. A gorgeous spot made so much more beautiful by the wonderful people we shared it with and the amazing food we ate. The open air kitchen was manned by Patrick Mulvaney and his crew and was set up on the other side of the meadow. Remarkable that they could put out 150 meals of such quality from a tent! Outstanding in the Field began doing these events in 1999 and now Jim Denevan and his crew and their bus (which wasn’t at our event….maybe in the shop?) tour the country and the world connecting diners with chefs at farms, ranches, beaches, orchards and whatever other beautiful surroundings they can find. Steve and I were lucky enough to sit with Kristy and Brian, the owners of Chowdown Farm who provided the guinea hens for dinner, as well as Thaddeus. We talked about farming, writing, food, children. And the difference between a guinea hen and a chicken (they’re smaller and cook faster). Start putting your nickels together….this is definitely something you should try to experience at least once. I’m already angling for another go. ps…here’s a code for new customers at Farm Fresh to You: LESL3898. It will get you a $10 discount on your first box and it gives me a credit…so thanks in advance! dining out for life tonight!